Zildjian L80 & Zildjian Gen16 Low Volume Cymbals Review: Realistic and responsive cymbals, without the sound. 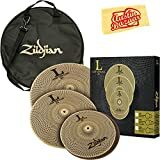 If you’re looking at Zildjian L80 & Gen16 low volume cymbals, this review has everything you need to know before you buy. We cover which low volume cymbals are best for your situation, and review both the L80 and Gen16. Zildjian L80 vs. Zildjian Gen16 review: What’s the difference? For low volume practicing, Zildjian L80 low volume cymbals are an excellent choice. The L80 range gives a realistic feeling cymbal, with a huge reduction in sound. Taking things a step further, the Zildjian Gen16 cymbal package gives the same low volume setup, with added realistic electronic cymbal sounds for live performances and practicing. We’re going to get in-depth on both of these Zildjian low volume cymbal options. Read on to see our review and comparison of these quiet cymbal options. Further down, we’ve got a quick guide if you’re wondering whether it’s best to buy the Zildjian L80 vs. the Gen16. If you want to keep the feel of real cymbals but lose the volume, the Zildjian L80 low volume cymbal range is made for you. 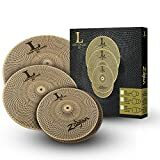 Zildjian L80 low volume cymbals have small holes drilled across the entire surface, which cuts the volume dramatically. These cymbals are made from metal, like real cymbals, meaning they behave like real cymbals. 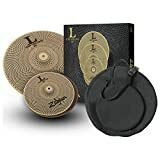 Zildjian’s claim of up to 80% volume reduction is fairly spot on… If you’ve never played something like this before, the lack of sound from the L80 is an interesting experience the first time you hit one. 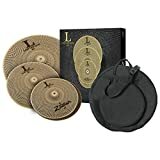 For practicing drums in apartments, dorm rooms, or at 3am anywhere, Zildjian’s L80 are the best low volume cymbal option around. They’re very well-made and function exactly like real cymbals, minus the sound. While they’re a little expensive, these cymbals a great investment if you can’t practice on a real drum kit. 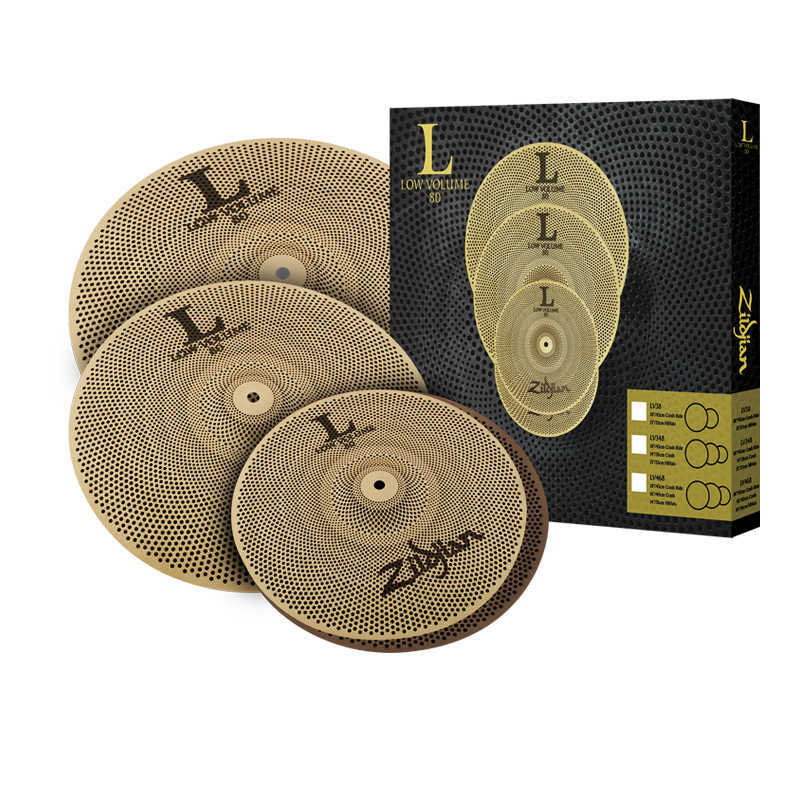 If you’ve ever used rubber cymbal mutes or towels across your cymbals to reduce the sound, the difference is night and day compared to Zildjian’s low volume cymbal range… It’s a huge plus to be able to play on low volume cymbals that behave exactly like real cymbals. Importantly, these low volume cymbals fit to any regular cymbal stand, meaning you don’t need to buy extra gear to mount them. They are available in packs, or individually. 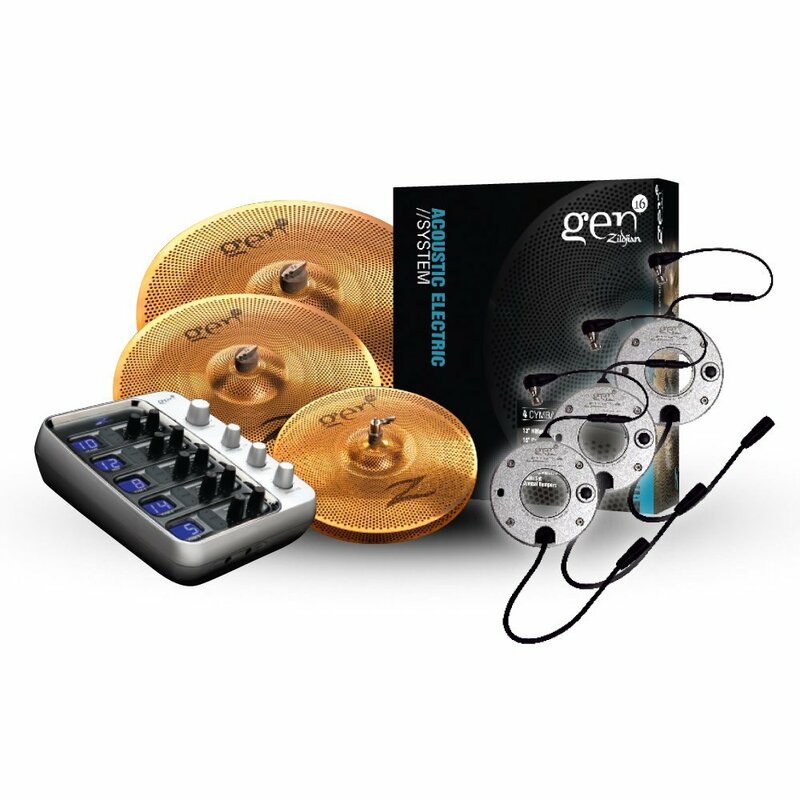 If you want to trigger real cymbal sounds, the Zildjian Gen16 low volume cymbal pack gives the same feel as the L80 range, with added electronic cymbal processing. The Gen16 module picks up each strike and movement of the cymbals, converting this into digital sound. Importantly, this is different from an electronic cymbal pad – the Gen16 converts the cymbal’s vibration into sound, allowing for much more realistic chokes, accents, and hi hat work. The technology here is different from a normal electronic cymbal pad which simply detects a “hit” and its velocity, and then plays a sound. The Gen16’s pickups are placed on the underside of the cymbal, and send a signal to the Gen16 module which controls the sounds. Since the Gen16’s sound is generated by a pickup, you can easily insert rivets in the holes of the cymbal to make a sizzle. If you’re the type of person who loves to experiment, the Gen16’s pickups can even be placed in different positions on the cymbal for more precise control: Closer to the bell gives you more higher frequencies, and closer to the bow will make things lower and trashier. While the pickup placement influences some of the tone, the real brain behind everything is the Gen16’s module. The brain that controls the sound of Zildjian’s Gen16 cymbals is called the Digital Cymbal Processor (DCP), and this module comes with a range of features that let you change each cymbal’s sound. There are tone shape presets, which give different cymbal tones (for example brighter, darker, fuller, thinner, trashier or more cutting). As well as this, each cymbal has a separate volume dial and left-right panning controls, and you also have a master reverb dial (with different reverb options). 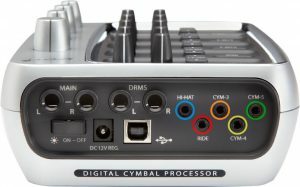 The Gen 16’s DCP comes with 20 different preset sounds for each cymbal, which is enough to suit almost any music style. The different tones give you great versatility, and allows you to match the sound of your cymbals to specific tracks and feels. For even more customisation, the DCP can be connected to computer via USB to use Zildjian’s Gen16 Access Tool. The Gen16 DCP can be connected to a Windows, Mac, or iOS device via USB cable. 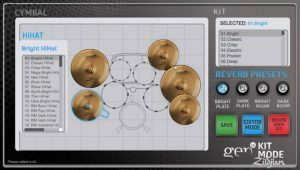 This connects you to the Gen16 Access Tool, where you have full control over your library of cymbal sounds. The Access Tool lets you quickly build your own custom cymbal kits: You can alter the stick attack, tone, pitch, cymbal wash, and reverb. 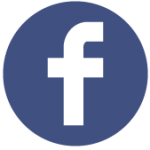 The original version of the Access Tool was less user-friendly, but the latest version is a nice upgrade and is much more intuitive to use. Along with the default range of sounds, Zildjian include some custom-made sounds by Russ Miller and Simon Edgoose which you can load up. Russ Miller gives a lot of general use “workhorse” cymbal sounds for an acoustic feel, while Simon Edgoose’s sounds lean more towards the electronic side. Zildjian give you some good options for input and output, to mix in or send your cymbal signal when practicing or playing shows. Firstly, the Gen16’s DCP module comes with an auxiliary input (with separate volume control), so you can plug in and blend electronic drums, trigger modules, or your own music (for example a phone or mp3 player). For those of you with triggers on mesh drumheads, this makes for easy connection with your drum trigger module. 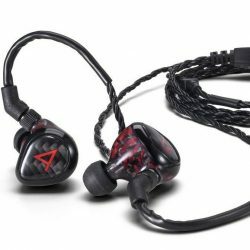 Importantly, there are also separate volume controls for the headphones and master out… This allows you to send a signal to the mixing desk when playing live, while also keeping full control over your own on-stage monitor mix. You can also choose to send the auxiliary input to both the headphones and master output, or just the headphones. This makes the Gen16 module extremely versatile, and usable in a huge range of different drumming environments. 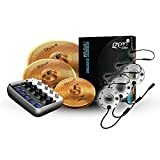 The input and output options also mean you can use the Zildjian Gen16 as the ultimate upgrade for an electronic drum kit: The realistic feel and response of Zildjian’s Gen16 cymbals are a huge improvement over traditional rubber electronic cymbal pads. The Zildjian Gen16 cymbal range is great for low volume gigging where real cymbals are too overpowering, or for a much more realistic-sounding practice setup. These cymbals can also be used like regular L80 cymbals (without the electronics turned on), making them a very versatile option. You can connect the Gen16 cymbals to other electronic gear using standard 1/4 inch jacks, or play along with your own music. 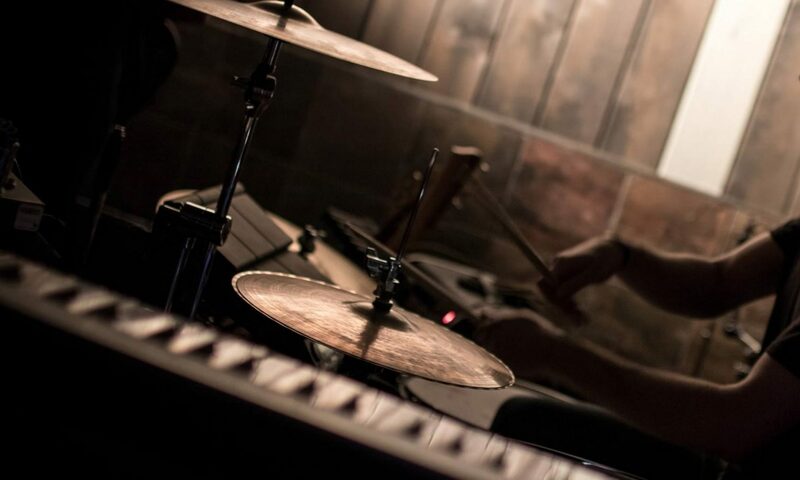 Put your headphones on, or plug them into a stereo or PA system, and you’ve got full control over your cymbal volume. 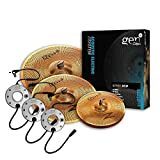 Like the L80 cymbals, the Zildjian Gen16 range is available in different packs, or you can buy these cymbals separately. L80 vs. Gen16: Which low volume cymbal package should I choose? Go with the Zildjian L80 cymbal range if you just want a low volume drum practice setup. 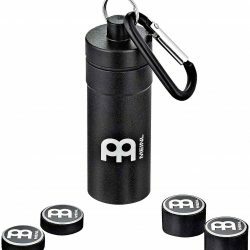 These are great for a practice room, and still give enough sound for you to hear what you’re doing. Choose Zildjian’s Gen16 cymbals for low volume live drum performances, and realistic-sounding low volume practicing with headphones or through speakers. Without the electronics turned on, the Gen16 range behaves exactly like the L80 low volume range, making them a more versatile choice. Note: If you already have Zildjian L80 cymbals, they can be paired with the Gen16 processor quite easily. The L80 and Gen16 cymbals are effectively the same thing, however the Gen16 is designed to be amplified or used with headphones. Here’s an overview of the Zildjian Gen16 low volume cymbal range: The same low volume setup as the L80 cymbals, with added electronics for low volume live performance or realistic-sounding practice. 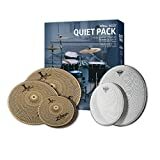 Tip: Pair the Zildjian L80 or Zildjian Gen16 low volume cymbals with Remo Silentstroke mesh drumheads, for the most realistic low volume drum practice setup. Play your real acoustic drum set without disturbing the neighbours. 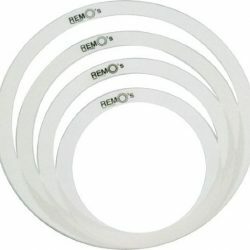 These mesh drumheads reduce the sound of your drums to almost nothing, and have a very realistic stick bounce. 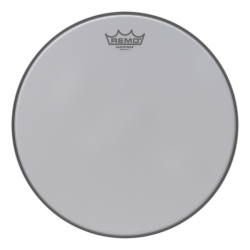 Remo Silentstroke mesh drumheads can also be tuned, with a tighter tuning meaning more responsiveness and bounce from your drumsticks. Paired with Zildjian L80 or Gen16 low volume cymbals, this is the perfect silent drumming setup. Want to read more about electronic drumming? See the compact electronic drum pad options in this article. Read our in-depth guides and drum articles.